I know WHY digging bluebells became a decade long project of my life. 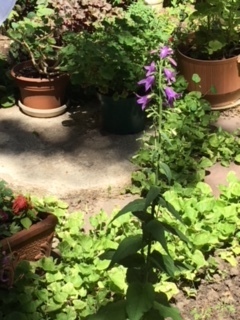 The Call to the Bluebell Journey was the gardeners’ wish to transform the courtyard of our condominium from a near dead zone to a garden. The only plant growing in the courtyard was bluebells. The bluebells were pretty for about two weeks, but after they bloomed the summer heat shriveled them into tan sticks. Moving the grape holly was easy. Designing and placing a new area for seating was fun, particularly because my then six-year old granddaughter created the semi-circular pattern, and helped move the flagstone squares into place. Gardens were placed between the seating area and the sidewalks. There were not many bluebells in these new beds, and I volunteered to dig them out. Our goal was gardens of multiple flower types, different colors, heights, and shapes. There was a plan for the raised bed veggie garden at the north end. Here the bluebells grew in profusion, and were spreading into the central portion of the courtyard. We placed a fence with a Gate In to that area, and I began to dig. Bluebell roots are like mini-parsnips with bindweed stringers, and are found around a foot below the ground surface. To foster a new plant, the stringers sneak from a mother root through the ground. Any 1/8 inch of stringer left will in time become a new mother root. In a very short time the only plant growing in an area will be the bluebells. The only poison that even touches them is bee-killing and cancer-causing; we refuse to use it. My task is not only digging down about one and a half feet for entire bluebell covered and nearby areas; it is also sifting the dirt to catch any tiny piece. The process I developed involves placing the chicken wire piece on top of a medium-sized black trash can, lifting a shovelful of dirt to the sieve, gently pushing the dirt across the sieve so the dirt falls into the trash can and the root pieces remain on top. I watch everything because the pieces are small – is it a piece of tree root? A pebble? No – it’s the soft, easily breakable bluebell root. When the trash can is full I deposit it into a pile of cleaned dirt. When a section is dug out I get into the space and find the bluebell stringers sneaking along the underside of tree roots, sprinkler pipes, and the edges of the building or sidewalks. When I’m sure a whole area is clean, I shovel the clean dirt back into place. This is a very slow, tedious, and committed work process. It takes all summer, but the next spring we are ready to build the raised vegetable beds. Any lazy moment produces an escaped piece that grows into a plant – this illustration is an example of one plant that grew this year in the cleaned space. I let it bloom, and then I dug it out, down to the foot below and all around it. Next year I don’t want ten of them, and the next year the whole garden to clean again. I am clear that sifting the dirt through the chicken wire sieve is the Sorting Seeds process given to many fairy tales heroines. In my play Waiting for Baba Yaga, the witch gives Vasalisa the task of determining which of a passel of seeds are living and which are dead. This traditional task teaches the skill of Discrimination, of being able to determine what is true and what is not, what is real and what is illusion. The Bluebell theme twist is that for the garden to have diversity, the living monoculture must be removed. Bluebell “seeds”, their choking root structures, are not healthy for the type of garden we are choosing to build. Once the patio area features healthy, diverse plants, the Bluebell project moves to a front garden area along the sidewalk. Here I am adding to the sorting task because there are pebbles and small rocks as well as the bluebell roots. I put a shovelful on the sieve, and move my fingers through it, causing the dirt to fall into the wastebasket. After I remove the roots the top of the sieve still has a small pile of rocks, which I first reuse to underline the areas under the tree roots and pipes (of which there are many, including roof drains). The amount of stones is due to another condo resident or garden committee who at least twenty years ago decided to put down black plastic and rocks, since decayed and scattered. The soil in the front is compacted and hard to dig. I have an intimate relationship to rain; the soil is too wet to dig the first day, just right for three days, too dry after that. We live in an arid high plains desert and there is not much rain. The task stretches on… last summer and now this, digging on and on…. I have been digging bluebells for seven years. I divide the digging task into three parts; I divide the three parts into smaller tasks; I make myself go dig. There are days when I can’t make myself; I bargain with myself for a half-hour… I end up lying on the floor, exhausted by the struggle. People wonder, encourage, and help. I have the only trained eye for sieving roots, but any stranger can dig out a shovelful or help me dump the wastebasket good dirt and the wagon of little stones. And to a person they are very pleased to have pitched in. Today I began planting the no-bluebells area. Dahlias and gladiola bulbs to the back, golden cone-flowers and a red iris in the middle, French lavender in the front. The planting is the Gate Out for me. As the new garden flowers in all its colorful diversity my neighbors know they contributed, and a piece of it is theirs. It was a garden of bluebells, now it is a garden of multiple colors, heights, shapes of a wide diversity of plants. And – the best of all blessings – no other place in this property has bluebells sneaking their roots to establish a monoculture. Share this piece of writing!